Hioki clamp on meters are best-in-class measuring devices incorporating Hioki’s expertise in current sensing technology. Model CM4373 is a 2000A True RMS clamp meter that features stronger jaws, broader -25℃ to 65℃ operating temperature range and IP54 dustproof and waterproof enclosure to enable professionals to work quickly in tough situations including the development, repair, and maintenance of equipment and devices such as electric vehicles. 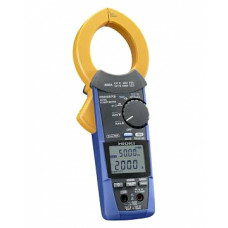 Additionally, the high-voltage DC measurement capability of up to 1700 V is ideal for the clamp maintenance inspections of electrical and solar power equipment. 600.0 A/2000 A, Basic accuracy: ±1.3% rdg. ±3 dgt. Basic accuracy: ±1.3% rdg. ±3 dgt. Basic accuracy: ±0.9% rdg. ±3 dgt. Basic accuracy: ±1.3% rdg. ±13 dgt. Display range switching: 0.000 VA to 3400 kVA, Accuracy: ±2.0% rdg. ±20 dgt.